(AUSTIN, TEXAS – March 10, 2018) – Ronen Sharabani, an international, multidisciplinary, prominent Israeli artist, has been selected as a featured artist for this year’s SXSW Art Program presented by Meural. His 2017 project titled, “Conductors and Resistance,” will be showcased this week during SXSW at the Austin Convention Center in Meeting Room 3 and is open to all SXSW official badge holders. The installation, which will be open to view to SXSW attendees until Saturday, March 17, is supported by United studios Israel, The-Artery, BARCO and NIIO. For information, please see here. For information on the artist, please see here. Sharabani will also be participating in a panel discussion at SXSW to be held at the JW Marriott on Tuesday, March 13 at 12:30 p.m. On this panel, three of the five artists in the SXSW Art Program pose questions about technology and explore themes of agency, autonomy and human-machine interaction in a technologically evolving world. For more information, see here. “Conductors and Resistance” is composed of imagery shot at the back of Sharabani’s Tel-Aviv studio, which was once an active and flourishing weaving factory. 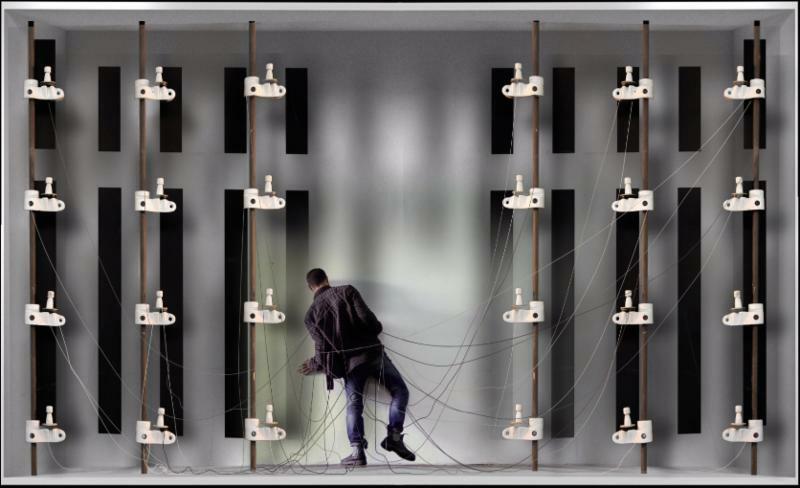 The images depict a weaving machine as well as woolen yarns, which were left behind, alongside electric wires, insinuating the inherent, structured, confusion between conductors and resistance. Sharabani seeks to use this particular confusion between Conductors and Resistance, to call upon the viewer to increase the currents of action in regions of high resistance. A conflict occurs where the flow of energy is not high enough to yield a reaction, thus compelling human intervention seeking relief for a blocked situation. This is not Sharabani’s first visit to Texas. In 2015, he did a site-specific video installation entitled “Matchbox” at The Contemporary Austin in the Betty and Edward Marcus Sculpture Park at Laguna Gloria. See here for more information. 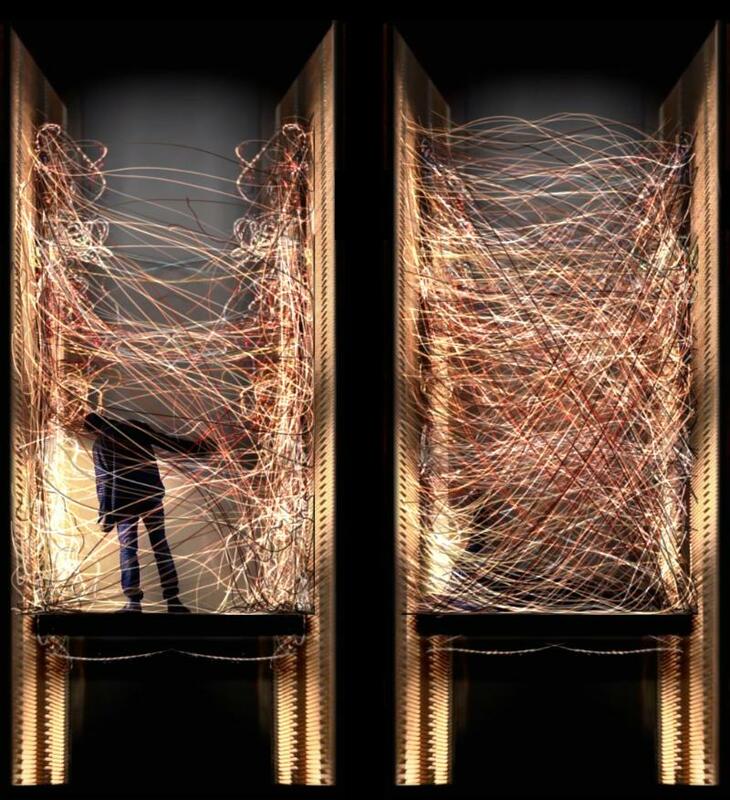 The SXSW Art Program presented by Meural showcases experiential and conceptual visual artworks that apply emerging technologies and immersive environments to spark discovery, inspiration, and connection. Incorporated into the broader ecosystem of creativity and innovation at SXSW, the art program serves as a launching point for collaborations and discussions around the role of visual and digital media arts in culture, technology and the public realm. Sharabani lives and works in Tel Aviv, Israel. He works in the diverse mediums of painting, sculpting and video installations. Sharabani’s art explores ritual, struggle, faith as well as cultural, economic and political values as the gateways for a transformational experience. His video works and installations blend movement, performance, architecture and light into intensely visual and sensory probes which simultaneously take a secular and spiritual form. Works in the public sphere apprehend a dominant place in Sharabani’s work, as this modus operandi permits a clean and unexpected encounter with the viewer; this situation bestows allure of freshness enabling a reexamination of the point of view, an aspiration evident in each of Sharabani works. He has also worked for film and production companies including The Artery VFX, McCann Erickson, and Dreamworks, in addition to John Sayles’s Silver City. In 2006, Sharabani won the Cannes Golden Lion Prize for best creative commercial. Sharabani’s predominant works include “Snap to Grid,” at the Nahum Gutman Museum of Art, Tel Aviv (2017); “Matchbox,” at The Contemporary, Austin, Texas (2016); “Blocks,” at Musrara Mix Festival, Jerusalem (2015); “Checkpoint,” at the Tel Aviv Museum of Art, Tel-Aviv (2015); “Golden Age,” at The Farm Gallery, Holon (2014); and “Chairs,” at Gabirol as part of White Night Tel-Aviv, Israel (2014). Sharabani was awarded the Cannes Gold Lion Prize, for creative commercial (2006); The Buckingham First Prize for the Expression of Music through Art (2003); The Hohenberg Scholarship (2003) and the Golden Feather, for editing (1998).